U.N. Secretary General candidate Antonio Guterres delivers his remarks in the United Nations Trusteeship Council Chamber, Tuesday, April 12, 2016. AP Photo/Richard Drew. As the United Nations celebrates its 70th birthday this year, the position of Secretary General has not become any easier. The spokesman for the interests of the peoples of the world has multiple fires to put off. How to deal with an unprecedented humanitarian crisis in the Mediterranean and the insecurity metastasis in Syria, how to address climate change, how to tackle rising populism and terrorism worldwide - the list goes on. Empowering the next Secretary General is a particularly pressing issue at this point in time, as the transition from the Millennium Development Goals (MDGs), which are coming to an end this year, to the Sustainable Development Goals, which will replace them, opens up a new, crucial phase for the organization. This could provide an opportunity for the UN to reflect, among other issues, on how its Secretary General is appointed. The election of the right person to lead the institution should not be seen as yet another instance of horse trading, but rather as an opportunity to strengthen the moral authority and influence of the person who nowadays comes closer to being our shared leader. The Secretary General is the symbolic head of the United Nations. As chapter XV of the United Nations Charter stipulates, he is the “chief administrative officer of the organization”. He must report to the General Assembly annually – a particularly useful mechanism to influence the world agenda – and he enjoys discretionary power to bring to the attention of the Security Council any threat arising against international peace and security. The Charter, however, does not include an explicit job description. Obviously, this is a job that is influenced by the political context at all times. Depending on each circumstance, the Secretary General must strive to find the middle ground between pumping up his role or limiting it to the letter of the Charter. Its considerable leverage must be true to the principles of independence, impartiality and integrity. The Secretary General cannot exhibit allegiance to any particular state. His loyalty lies with the United Nations and he must make his decisions regardless of his state of origin. Depending, as he does, on the support of the member states, he or she must find a balance between their interests and those of the UN. For good reason the role of Secretary General has been described as being that of “a diplomat, an advocate and a civil servant” – in equal parts. Eight individuals have served as Secretary General of the UN in the past. The current incumbent, Mr. Ban Ki-Moon, was the first East Asian to hold office. He was first elected on June, 21st, 2011, and his second term began on January, 1st, 2012. Many consider that his performance has been disappointing. In fact, Mr. Ban Ki-Moon has done exactly what those who elected him knew he would do. Article 97 of the United Nations Charter establishes that the Secretary General “shall be appointed by the General Assembly upon the recommendation of the Security Council”. Traditionally, the Security Council recommends only one candidate. It is its prerogative to privately pick a candidate, and then adopt a resolution setting out its recommendation. Nothing in the Charter prevents the Security Council from recommending several candidates, but GA Resolution 11 (I) states that it is “desirable for the Security Council to proffer only one candidate”. Since Mr. Ban Ki-Moon is to step down on December, 31st, 2016, the process to elect a new Secretary General is currently under way. The process is as undemocratic as ever, but, for the first time, some transparency has been added to it. The UN asked candidates to send formal application letters, and to make a presentation of their vision of the UN at a public hearing. This unprecedented move takes no power away from the Security Council, which will ultimately decide on the candidate it wants to recommend, but it nonetheless signals a new openness which, as Mogens Lykketoft, the outgoing President of the General Assembly says, may be “potentially a game-changing exercise”. Is it time for a woman to get the job? Antonio Guterres, the former Portuguese prime-minister who served as UN High Commissioner for Refugees, is the front runner, according to the UN Security Council´s straw polls held to date. The 15 members of the Security Council, though informal ballots, choose to “encourage”, “discourage” or issue no opinion on any given candidate. In order to become the next Secretary General, a candidate requires the affirmative vote of nine of its members, and must not be vetoed by any of the five permanent members of the Council (China, Russia, France, the United Kingdom and the United States), known as the “Big Five” or “P-5”. 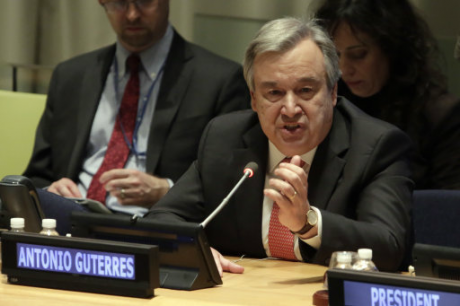 After holding the fourth straw poll on September, 9, Antonio Guterres has consolidated his lead over the ten remaining candidates (now nine, as Costa Rica’s Christiana Figueres withdrew from the race on September, 12) to replace Mr. Ban Ki-Moon. Mr. Guterres received twelve “encourage” votes, two “discourage” votes, and one “no opinion” vote. Miroslav Lajčák, Slovakia´s foreign minister, came second, with ten “encourage votes”, four “discourage” votes, and one “no opinion", followed by Vuk Jeremić, Serbia´s former foreign minister, and Srgjan Kerim, the Macedonian former president of the General Assembly. Irina Bokova, UNESCO´s director general, and apparently the only woman still in the race, came fifth, after having ranked third in the previous straw poll. It should be noted that all the ballots that have taken place so far have been undifferentiated straw polls. A clearer picture is expected to surface in early October when, through a colour-coded straw poll, we will know if the “discourage” votes have been cast by elected or permanent members of the Security Council. Historically, the Secretary General has been selected according to an informal system of regional rotation. During this last year, there has been mounting pressure for having a woman as next UN Secretary General, as well as a widespread campaign to appoint a candidate from Eastern Europe. Neither a woman nor an Eastern European has ever been appointed. Unfortunately, as the latest straw-poll results reflect, women candidates trail behind the favourites. The UN Women Secretary General, Ms. Mlambo-Ngcuka, expressed her “disappointment and surprise” at the outcome of the polls. Irina Bokova, the best-placed to challenge Mr. Guterres, came only fifth, while the remaining female candidates (Susana Malcorra, Helen Clark, Christiana Figueres and Natalia Gherman) stood at the bottom of the list. Hopes for a woman to be appointed thus seem to be fading. Still, addressing the gender gap at the UN will surely remain a priority, independently of who gets the job. Beyond the valid claims for a woman and/or an Eastern European to assume the role of Secretary General, the undemocratic nature of the election procedure remains a key issue to address. Calls for reform are not new. Back in 2014, WFM-IGP and several NGO partners sent an open letter to both the General Assembly and the heads of government of the member states, suggesting several proposals to put an end to the current election procedure. The 1 for 7 billion campaign -- supported by more than 750 organizations around the world – has called for a more transparent procedure, for public hearings to take place, and for the Security Council to recommend at least two candidates. Some of these demands have been met. For the first time, public hearings have taken place; member states have been asked to nominate candidates; and candidates have not been chosen behind closed doors. Yet, the final election procedure remains far from being democratic, secretive and outdated: it leaves it up to five countries to make a recommendation that concerns us all. This procedure needs to be changed if the UN is to avoid making the same mistakes all over again. Merit alone should guide the election procedure, for the UN needs the best candidate for the post, an individual who is capable of transcending the role of mere intermediary, and who is willing, if need be, to go beyond the letter of the Charter. Gender and geographical balance should also be requirements of the new procedure. The 1 for 7 billion campaign recommendations on the term of office and the number of candidates should also be implemented. Independence would be reinforced by limiting the mandate to a 7-year single term, as the candidate would not have to think about getting himself re-elected for a second term. Democracy would also benefit if two or more candidates were recommended by the Security Council for the General Assembly to choose from, enhancing debate within the institution. Transparency, at a time when confidence in institutions has globally reached a new low, should be a must. In practice, the permanent members of the Security Council are the ones who choose the nearest thing we have to a global leader. Therefore, it is only logical that citizens and member countries should understand how they do it. The Security Council should provide information about the results of the straw polls and formal voting, clearly differentiating the votes of the permanent members from the rest. Under the current framework, and independently of the candidate recommended, we can only hope for a candidate that is not too objectionable, as happened in 2006. Incapable as we are, for the time being, to limit the power of the Security Council to make decisions in our name, we should do the next best thing: hold it accountable. The “Big Five” may not agree on the need for a strong, dynamic and idealistic Secretary General. But the world surely does. Meanwhile, the Portuguese government is confident that Mr. Guterres´s merits will lead him to take over as UN Secretary General.